Did Murdoch's The Australian Misrepresent IPCC Chair Pachauri on Global Warming? As we have discussed many times at Skeptical Science, although the warming of global surface air temperatures has slowed over the past decade due to a preponderance of La Niña events, the rate of heat accumulation on Earth has not slowed at all. In fact over the past 15 years, the planet has accumulated more heat than during the previous 15 years (Figure 1). That's global warming. Unfortunately many people (often even including climate scientists) mistakenly equate the warming of global surface air temperatures with global warming. That is simply inaccurate. 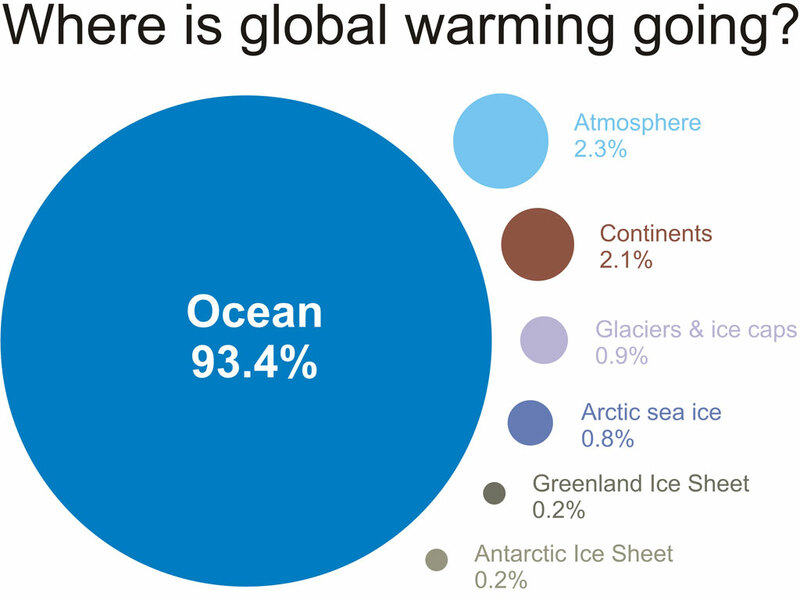 Approximately 90% of global warming goes into heating the oceans (Figure 2). 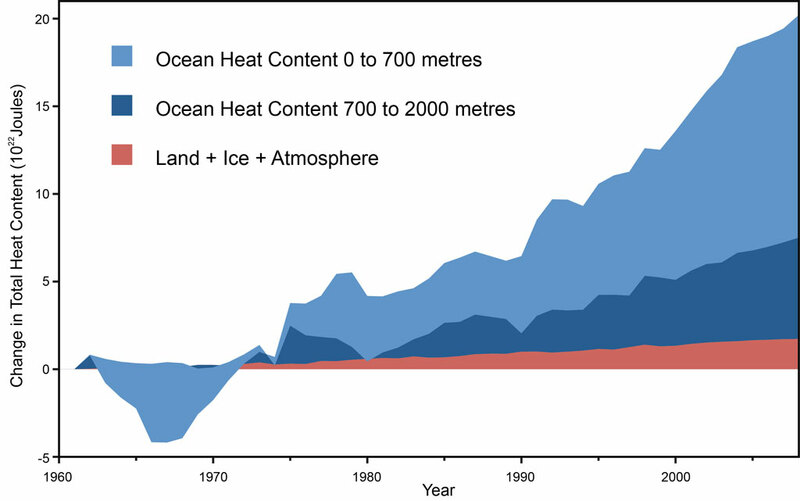 Figure 2: A visual depiction of how much global warming heat is going into the various components of the climate system for the period 1993 to 2003, calculated from IPCC AR4 5.2.2.3. So the reality is that global warming continues unabated. Despite this reality, an article by Graham Lloyd in The Australian (paywalled) claims that the chairman of the Intergovernmental Panel on Climate Change (IPCC), Rajendra Pachauri agreed that there has been a 17-year pause in global temperature rises. Unfortunately we don't know exactly what Pachauri said on the subject, because Lloyd did not quote him directly (which is a red flag). The IPCC communications office tells Skeptical Science that The Australian has not provided a transcript or audio file of the interview for verification, but it does not accurately represent Pachauri's thoughts on the subject - namely that as discussed in this post, global surface temperatures have plateaued (though over the past decade, not 17 years), and that this in no way disproves global warming. Despite the lack of useful verifiable content, the story headline has nevertheless gone viral. This is not the first time Lloyd has been caught misrepresenting climate science in The Australian - in January of this 2013 he wrongly claimed that a study had found no link between global warming and sea level rise. Oceanographer John Church, who was co-author on the misrepresented research in question and also Nuccitelli et al. (2012) from which Figure 1 above originated, set the record straight, and The Australian was forced to retract the article. Unlike in Britain, there has been little publicity in Australia given to recent acknowledgment by peak climate-science bodies in Britain and the US of what has been a 17-year pause in global warming. Britain's Met Office has revised down its forecast for a global temperature rise, predicting no further increase to 2017, which would extend the pause to 21 years. Dr Pachauri said global average temperatures had plateaued at record levels and that the halt did not disprove global warming. "The climate is changing because of natural factors and the impact of human actions," Dr Pachauri said. The claim about the "peak climate-science bodies" undoubtedly refers to another misleading newspaper article wrongly claiming that global warming stopped by the Mail's David Rose, and Lloyd's comment about the Met Office prediction is also inaccurate. Ultimately the only statement the Australian article attributes to Pachauri on this subject is that "global average temperatures had plateaued at record levels and that the halt did not disprove global warming." Again note that the story is paraphrasing Pachauri rather than quoting him directly. Had he said that global surface air temperatures have plateaued and that this doesn't disprove global warming, he would be 100% correct. Though it's also worth noting that over the past 17 years, the global surface temperature trend is approximately 0.10 ± 0.13°C per decade, which is most likely positive (warming). More importantly, over the past 17 years the planet has accumulated the equivalent energy to detonating 3.7 Hiroshima atomic bombs per second, every second. It takes a fundamental misundertanding of the global climate to deny that immense amount of global warming. As long as humans continue to increase the greenhouse effect by adding more and more CO2 to the atmosphere, global warming will continue. That is a physical reality that cannot be changed by misstatements or misquotes or misrepresentations or denial. Global warming will not stop until we do something to stop it. To hear what Pachauri actually thinks about global warming without first passing through The Australian's filter, you can listen to interviews with him on Radio Australia and ABC News. Also see a similar debunking of this myth by The Australian Climate Commission.